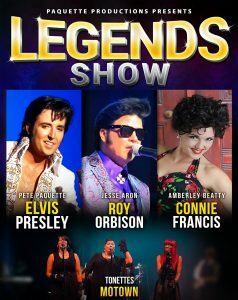 The May 12th Legends Show will feature the most incredible Tributes to Roy Orbison, Connie Francis, Elvis Presley, and Motown. Accompanied by Toronto’s “Rockin’ Royals Band”. Performing as Roy Orbison, Jesse Aron, who hails from the State of Wisconsin, is recognized as one of USA’s top Roy Orbison Tribute performers. With his effortless voice and uncanny resemblance to Roy, Jesse will take you back in time with such hits as ‘Crying’, ‘Pretty Woman’, ‘Only The Lonely’, ‘Running Scared’, and many more of your favourites. The Tonettes: Cathy, Marlene and Amoy as you have never seen them before, have been blessed with power, sensitivity, and vocal energy. This sensational trio will be performing a variety of songs dedicated to Motown. This special performance is one rarely seen by this amazing group of singers. 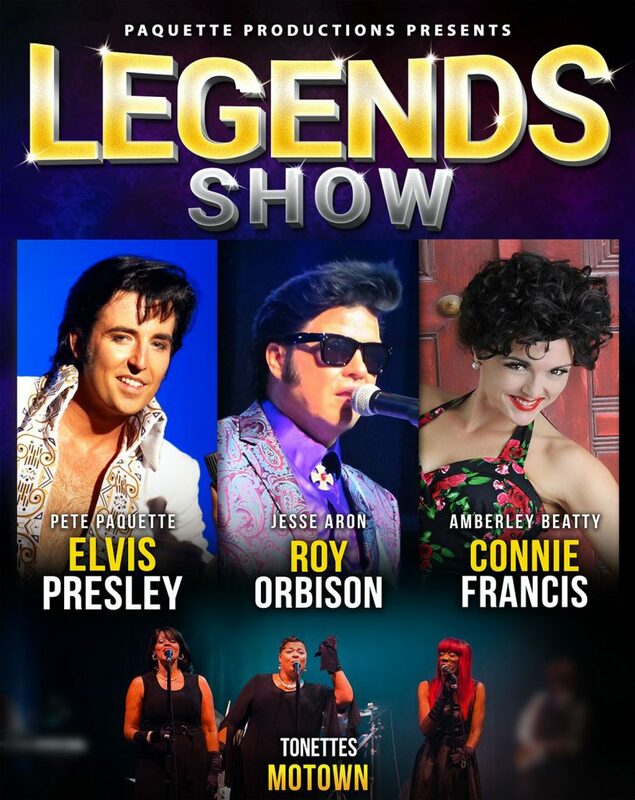 Pete Paquette is a World-class Elvis Tribute Artist that is in great demand and is highly regarded as one of the top Elvis performers in the business today. Known for captivating his audiences through his incredible voice, high energy, charisma, and playful spontaneity with his audiences, this multi-award winning performer will leave you wanting more.